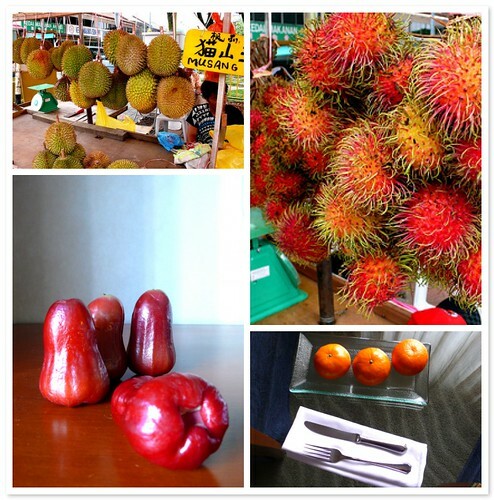 getting a little fruity in kl. i had some fun correspondence with the housekeeping staff at my hotel; i would leave them one of the bento boxes from the conference (not bad but i'm in kl--sooo many more possibilities) during the lunch break, then return to find more than my fair share of whatever fruit was on offer from the housekeeping cart. whoo! unnamed housekeepers, you rock! of course, no one left me any durian (shucks), but i saw it quite a bit in the produce stalls around the city; no one wanted to split one, so i didn't try the local version (for the record--yes, i've tried it before, and like it okay. the smell doesn't bother me, but whilst the flavour is complex on the sweet end of the spectrum, it lacks an acidity i look for in most fruit). the mighty mangosteen and prickly rambutan, on the other hand, were bought at any given opportunity, and eaten just as quickly--hence, the woeful lack of photos. 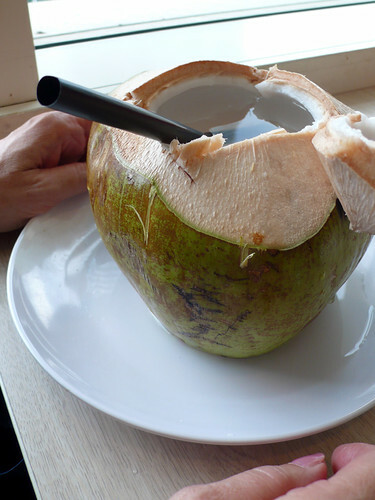 also imbibed whenever possible: fresh coconut water, in the young coconut, served with a straw and also a spoon, to scoop out the tender, sweet flesh; coconut water contains a high amount of potassium (lots more than a banana), and helps a body rehydrate easier than just cold water. also sucked up: sugar cane juice, freshly expressed from the cane, diluted only with copious amounts of ice, and a touch of fresh lemon. cane juice is nowhere near as sweet as you would imagine, as it comes from the younger, greener cane, picked before the sugars develop. 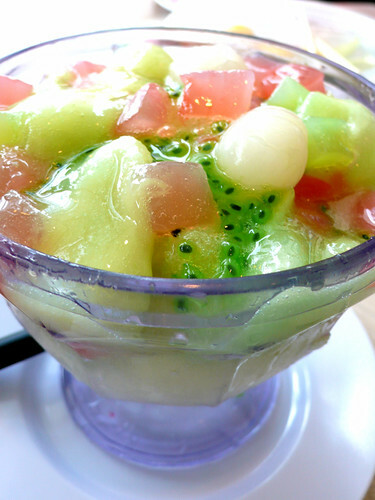 probably my most favourite dessert in kl is the shave ice treats topped with fresh and preserved fruits, but unlike the filipino halo-halo, korean bingsu, or even its regional sister ais kacang, it does not have red beans or dairy added, so it is much lighter on the stomach. too many fruit concoctions and combinations were available; this one had fresh soursop pieces, preserved palm fruit, mochi balls, and nata de coco (fermented coconut water gel) covered in a guava syrup and basil seed syrup. 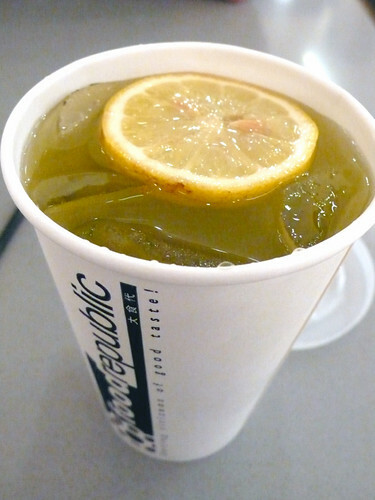 fresh, fruity, sweet, yet sharp, icy and refreshing. imho, the best fruit brought over by the housekeeping staff was the local wax jambu (if you want to get all latin fancy it's Syzygium samarangense.) 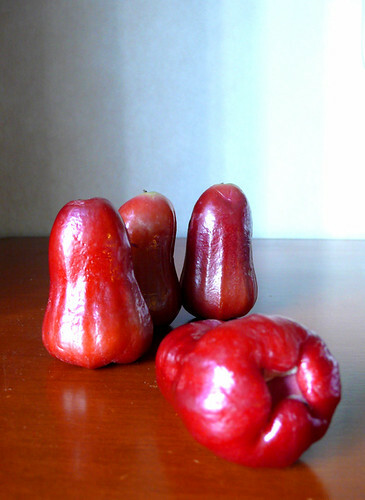 it is known in the philippines as macopa, and on the island as simply "mountain apples." i never see fruit as big as this here on island, nor this colour--usually it's white or pinkish here, but in malaysia--where it is cultivated for harvest--it comes in a rainbow assortment from white to yellow to green to various shades of pink and red. the interior is snowy white, with a cellulosey texture and flavour similar to an asian pear but slightly spongy and lighter. as i can only get it on island in the wild or from other people's backyards, i took every opportunity to munch on this simple but satisfying gift. 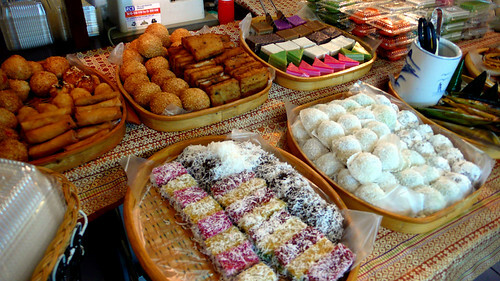 kuih (plural: kuih mueh): local, traditional-style cakes and morsels that use native ingredients and are generally sweet, occasionally savoury, and sometimes both. 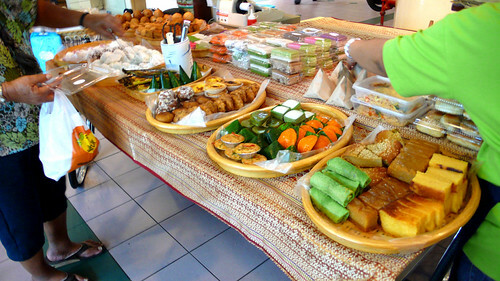 typical main ingredients are some form of glutinous rice, coconut, and gula melaka (palm sugar). you can find them anywhere there is food; in kl, there is food everywhere. i had more than my share of different kuihs, not all of them photographed as they were more important as food than as models. here are some of the ones that didn't get gobbled down straightaway. after our dinner, miss boo took me to a market area of kampung baru, where she bought me putu bambu, very similar to the filipino puto bumbong, which are also steamed in pieces of bamboo. 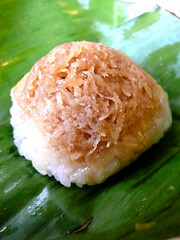 small lengths of bamboo are cut down, and a dryish glutinous rice flour mixture is packed into them. they are placed upright onto a special steamer. 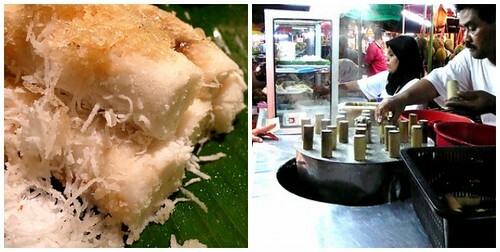 once they are done, they are pushed out of the bamboo length, topped with fresh coconut and gula melaka, and the process is repeated endlessly into the night. these were lighter in flavour and texture than the filipino version (mainly because the pinoy version adds ube, or purple mountain yam), but just as delicious. 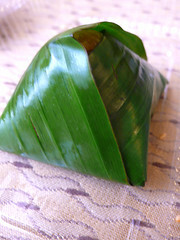 pulut inti is a cute little pyramid of steamed glutinous rice, topped with a mound of coconut and gula melaka. the thing that sets it apart from the rest is the unique shape, and the fairly equal ratio of coconut to sugar to rice. 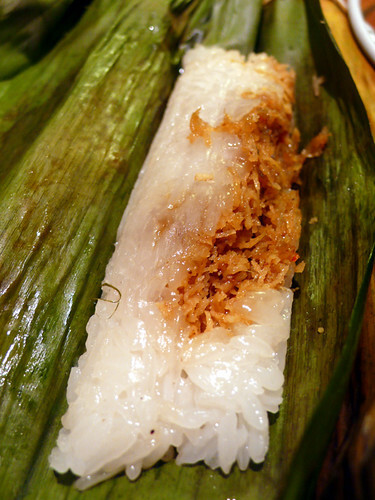 pulut udang is similar to the pinoy suman, in that it is glutinous rice steamed in banana leaf, but it contains a sweet-savoury filling of chopped dried prawn or anchovy, mixed with a bit of sugar. a little odd, but tasty combination. 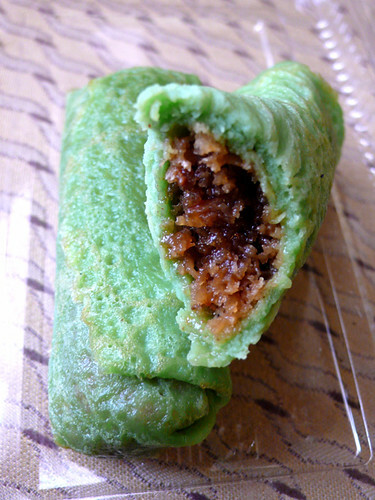 my favourite of all of them, however, would have to be the kuih ketayap--a small pandan flavoured crêpe wrapped around a gula melaka and coconut filling. there's something about the moist, spongy pancake in contrast with the nutty, sweet interior that i really enjoyed. if anyone has a recipe for this, send it my way!